The SFSU Observatory is located on the roof of Thornton Hall on the campus of San Francisco State University (Click here for Google Directions). 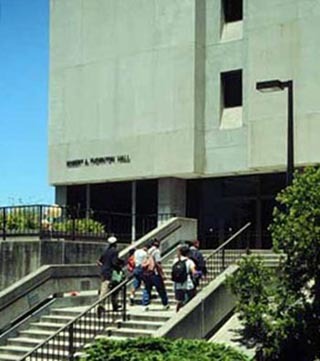 Thornton Hall is in the northeastern corner of the SFSU campus, off of 19th Avenue, in the Lake Merced region of San Francisco. Here is some info on parking at SFSU: Parking. The Charles F. Hagar Planetarium is located on the 4th floor of Thornton Hall, directly across from the elevators. For the Observatory, take the elevators to the 9th floor, then find the stairwell and take the stairs up to the top (3 half-flights). The Observatory is on the 10th floor, Room 1004.